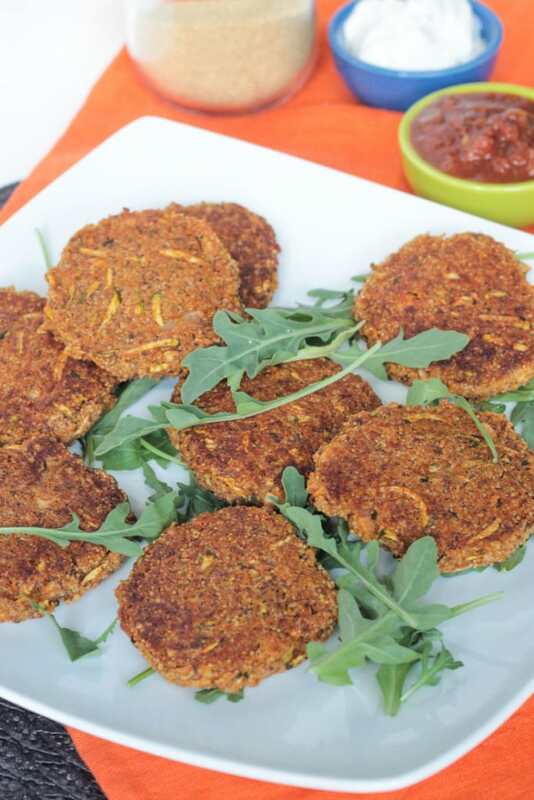 Baked Zucchini Amaranth Patties – A quick and easy high protein recipe perfect for a weeknight. Serve it with a salad for a complete meal. Raise your hand if you have more zucchini than you know what to do with this summer. Maybe you are growing it in your garden, you bought it at the farmers market or your neighbor dropped one off the size of your arm (we’ve all been there!). 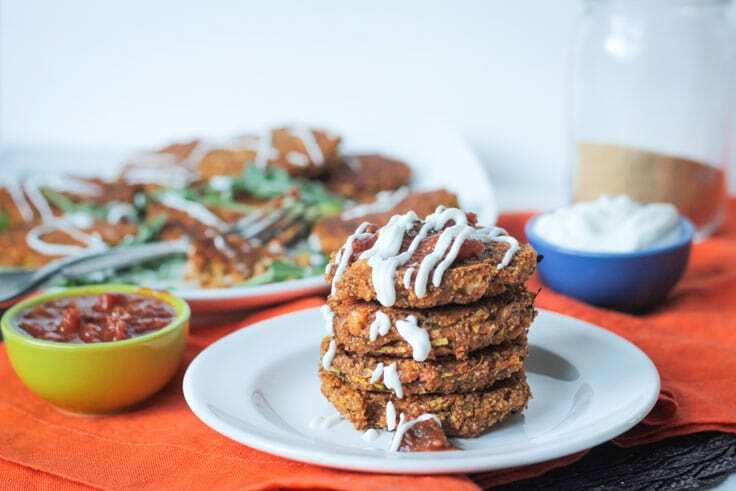 This recipe for oil free Baked Zucchini Amaranth Patties will help you use up some of that delicious green squash and will also introduce you to the nutritiously packed seed, amaranth. Amaranth is a gluten free, complete protein seed, belonging to the same family as quinoa and chard. Not only is it high in protein, but it also contains plenty of iron, fiber, magnesium and calcium. When cooked, it becomes like creamy like porridge while still maintaining a bit of a crunch. The flavor is slightly nutty. You can mix it with rice, quinoa or other grains to enhance the nutritional profile of a dish. Amaranth seeds can also be popped like popcorn and added to cereals or granola. These patties are crunchy on the outside and creamy on the inside. I load them up with zucchini, onions, salsa and some spices to compliment the earthiness of the amaranth. And I serve them up with extra salsa and some vegan sour cream. They are delicious! You can eat them on a bun like a burger if you want, they should stay together just fine, but I didn’t intend for them to be eaten that way. I like to use my fork to dip a piece in the salsa/vegan sour cream mixture…so yummy! 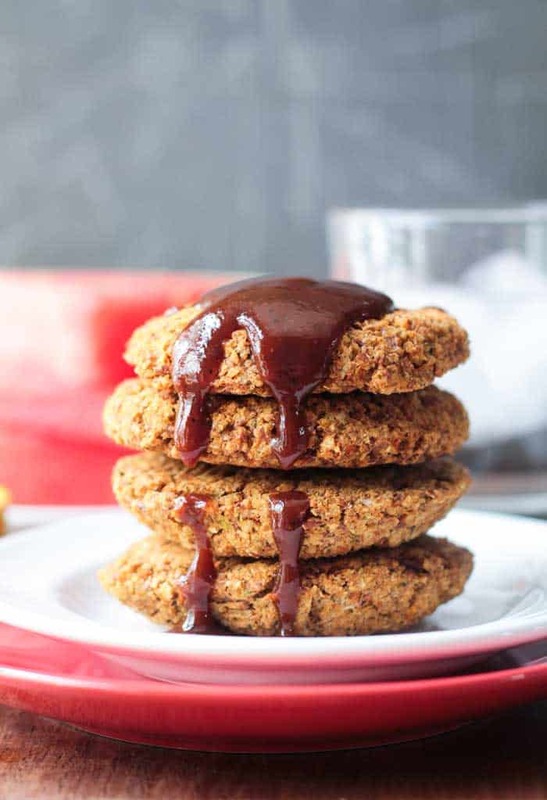 These amaranth patties come together quickly and easily and only take 30 minutes to bake, making them a perfect weeknight meal. Serve them with a salad for a complete meal. 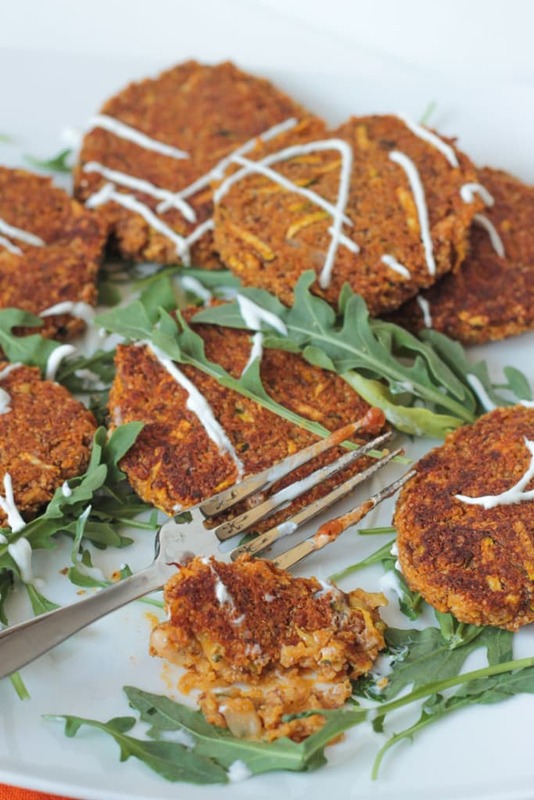 I hope you love these Zucchini Amaranth Patties as much as we do. If you try them, please come back and leave me a comment below with your feedback. You can also find me on social media. Be sure to tag @veggie_inspired and #veggieinspired so I’m sure to see it. Enjoy! A quick and easy high protein recipe perfect for a weeknight. Serve it with a salad for a complete meal. Extra Salsa and Vegan Sour Cream for serving , if desired. In a pot on the stove, place the amaranth and vegetables stock. Bring to a boil, then reduce the heat to simmer, uncovered, until the water is absorbed. Meanwhile, place white beans in a large bowl and smash with a potato masher or fork until mostly broken down (a few whole beans left is fine). Add all remaining ingredients to the white beans, including the amaranth once it's cooked and cooled enough to handle. Mix well. Form into patties (I like them on the smaller side - about 3 inches in diameter and less than 1/2 inch thick) and place onto the parchment lined baking sheet. Bake 20 minutes, flip the patties over and bake another 10 minutes until crispy on both sides. Serve with salsa and vegan sour cream, if using. ~You can dice the onion small instead of shredding if you wish. For convenience, I stuck it in the food processor (fitted with the shredding blade) at the same time I shredded the zucchini. Easy! Hi, Dalila. Red beans will work. They are a stronger flavor than white beans so it may just the flavor profile just a bit, but I think would still be delicious. Let me know how they turn out. Enjoy! Is it okay if we use and image and link it back to your url? Yay 🙂 We just published it online! That was fast. Thank you! Thanks, Harriet! The amaranth really is the star of the show here. The zucchini lends moisture and nutrition though, for sure! These are gorgeous, Jenn. I’m always looking for new burger ideas, and this is perfect. Thanks! Thanks, Linda! Let me know what you think! These look amazing, Jenn!! What a great combo! 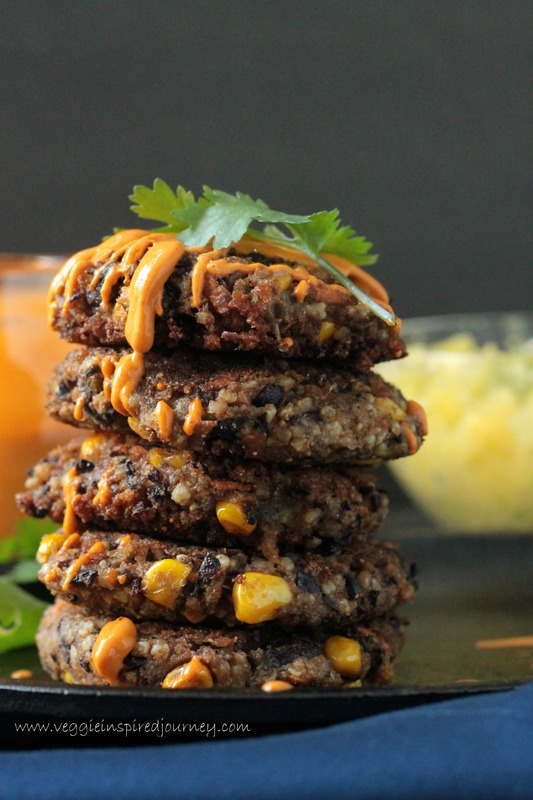 🙂 I can never get enough of veggie burgers, so I’ll just have to try these! Thanks, Julie! Please let me know if you make them. 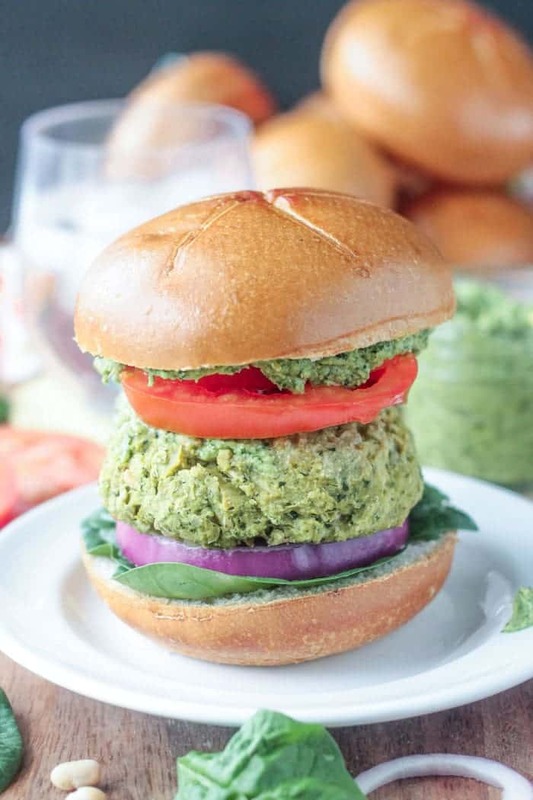 Veggie burgers and patties are the best – so quick and easy….and delicious! I’ve never tried amaranth before! These look so good! i love zucchini too, it’s my favorite veggie! Just posted a zucchini recipe today in fact, lol! I could eat them everyday! These look like the perfect way to use them up! 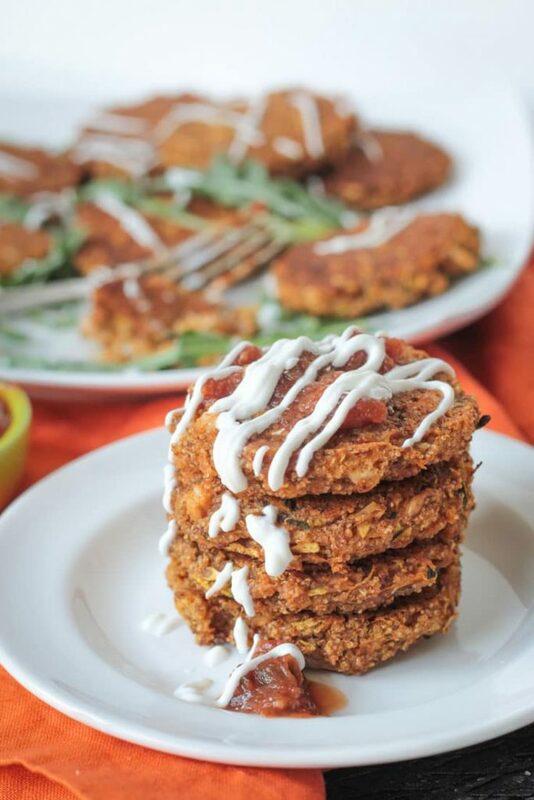 Making vegan fritters can be so hard – without the egg its so easy for them to fall apart. But you did such an amazing job here!! Yeah, sometimes it can be tricky. These worked so well! The amaranth is pretty sticky so it’s perfect! Thank you so much! You know I haven’t cooked/made anything with amaranth before. And not sure why I haven’t. BUT. 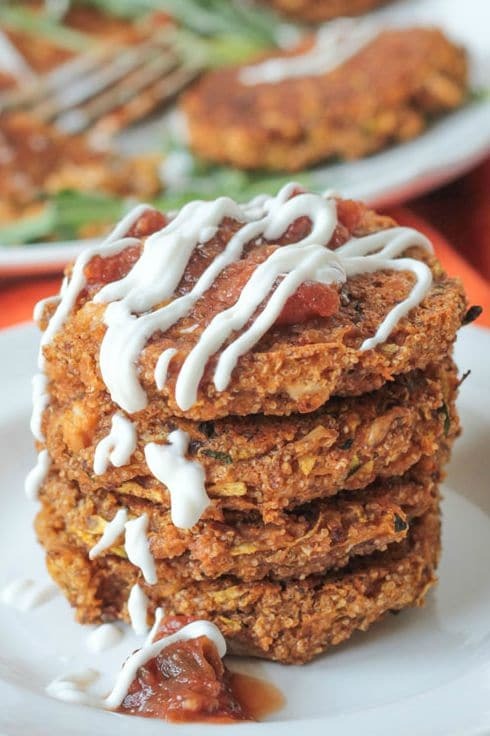 That’s all about to change because I definitely need to have these zucchini patties in my life, like now! Thanks, Meg! I’m finding that a lot of people are unfamiliar with amaranth. It’s so deliciously nutty. So if you like that sort of thing, you will love these! They are so good with the salsa! Let me know if you try them! I’m trying to find more vegetarian recipes to make for dinner mid-week and this looks delicious. I’ve never cooked with Amaranth before either. I can’t wait to give it a try! Great, Sarah! I hope you love them! Amaranth is so deliciously nutty! These would also freeze really well and reheat quickly! I can’t wait to try these Jenn! I have never tried amaranth seeds before – they sound absolutely wonderful!!! And loving that crispy exterior of these patties! YUM!!! Thanks, Ceara! Yes, such a crispy outside while still be soft and creamy inside. It’s so yummy! Yay! You used amaranth! <3 I love that little bit of salsa you threw in too! And yes, I bought WAY to much zucchini these last two weeks and even though I use it every day, it's never ending now! HaHa!! I KNEW there were people swimming in zucchini out there!! I love amaranth! Such a crunchy nutty little thing…so yummy! And everything is better with salsa, right?! Thanks, Rebecca!